If you haven't read Starcrossed yet and dislike spoilers, then I would suggest that you stop reading my review right about now and come back to it once you've read Starcrossed. Having said that, if you don't mind some spoilers for Starcrossed, do feel free to read on--but if I were you, I'd read Starcrossed first. Helen is the Descender, the only Scion able to cross into Hades as she wishes and because of this, it's up to her to find the Furies and find a way to end their cries for vengeance which drive the Scions to kill members of other Houses. Determined to get it over with as quickly as she can, Helen descends every night, only to find herself completely alone and wandering aimlessly until she is saved one night--from quicksand--by a male Scion she's never met before. And the problem with all this descending? It's taking its toll on both her body and her mind. All the while the Hundred are still out there, plotting away and they're not the only ones plotting to use Helen. To put it simply, do expect some romantic scenes in Dreamless, but don't expect it to be the bulk of the book. Seriously, the focus is definitely on Helen, Hades (realm), and the Furies. Having said that, I can't quite put my finger on it, but it felt like Dreamless was missing something--I think I was hoping for a more heart wrenching case of the "we cannot be together"-ness? Don't get me wrong, Lucas definitely doesn't take it well and Helen is less than pleased with it, but it didn't really grab me this time around. Maybe it's because I like the new guy? That's definitely possible because he seems like a genuinely nice guy--at least so far. But personally? I'd take Morpheus over the two Helen has to pick between any day--this coming from someone who likes to dream (and sleep) though. Definitely do expect to learn more about the Gods in Dreamless and do expect to get familiar with the many landscapes in Hades. 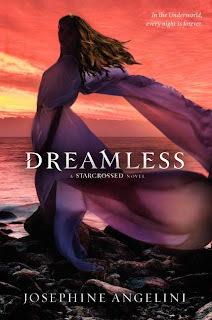 If you enjoyed the first book, then I definitely think you'll enjoy Dreamless as well. You'll get to see all of your favorite characters again and you'll get to meet some new characters as well--which is always a plus. In all, another engrossing read written by Josephine Angelini and I can't wait to see what will happen in the third book!